Uber's latest update for its mobile apps finally solves one of the biggest problems with the service: drivers having no damn clue where they're going. First, the updated app allows passengers can enter their destination into the app before they're picked up, but that destination isn't displayed until the passenger is in the car – ensuring drivers don't hand-pick the most convenient fares. Second, once the destination is sent to the driver's phone, they'll get the option to receive turn-by-turn directions directly through the Uber app, rather than having to switch between that and another nav app. Uber isn't saying exactly what's powering the mapping program, but it tells TechCrunch that it's using a combination of its own tech and a third-party system that provides mapping and ETA estimates. And if Uber is baking in its massive treasure trove of logistical and routing data, that could provide more efficient routes based on current and historical traffic patterns. 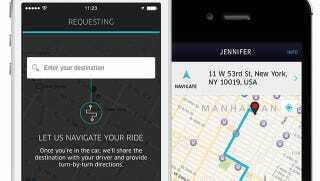 The other reason for the app's new functionality is the recently launched Uberpool feature, which lets passengers share rides to the same destination. With passengers plugging in an address when they request a lift, Uber can find other riders heading to the same destination, allowing them to split the fare, making Uber an actual ridesharing service, not just a glorified black car with an app.